Pinguecula is a yellow lump or spots that grow in the clear conjunctival coating along the eyelid and cover the whites of the eyes (sclera). Pinguecula spots or bumps are usually seen in other parts of the cornea. When experiencing pinguecula, the patient's eyes will feel dry, red, swelling or pain. However, the growth of lumps or spots on the pinguecula is classified as benign and not cancer, so it is not dangerous. Generally, pinguecula experienced by elderly people (elderly). Pinguecula is shown with small yellowish spots or bumps on triangular conjunctiva. The spots or bumps are located on the side of the cornea near the nose. Pinguecula can get bigger, although it takes several years. Conjunctiva of red and swollen eyes. Eyes dry, itchy, burning, or like there is sand stuck inside the eye. The cause of pinguecula cannot be ascertained. However, several factors are associated with the appearance of this disease, including too often exposed to sun, dust, or wind. 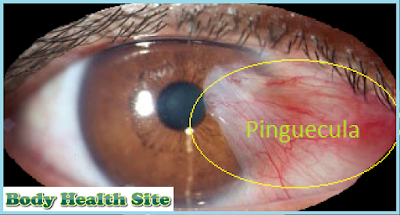 Pinguecula is derived from tissue in the conjunctiva that changes, resulting in a small bump or spots. In lumps or pinguecula spots, there is a fat, calcium, or both. Pinguecula can be diagnosed through a physical examination of the eye. Generally, no treatment is required and the patient can recover by itself. Treatment can be done when the eyes feel very uncomfortable or vision is blocked. In order to overcome the discomfort in the eyes (usually taste like there is sand) and irritation due to dry eye, the doctor can give eye drops or eye ointment. To relieve red or swollen eyes, the doctor will give corticosteroid eye drops. If the growth of pinguecula is deemed to interfere with appearance, the lump or spots can be removed by surgery. The choice of surgery can also be considered if the pinguecula grows on the cornea that may interfere with vision, or if it continues to cause inflammation and discomfort even if it has been treated. Wear black glasses when outdoors, especially if frequent outdoor activities. This effort aims to block the radiation of ultraviolet A (UVA) and B (UVB) and protect the eyes from wind or dust. Use synthetic tears to keep the eyes moist, and to relieve dry eyes, redness, and pain. Use eye protection, especially when working with chemicals or cleaning dusty rooms. Do not smoke. Nicotine and other chemicals in cigarettes can worsen the symptoms of pinguecula. 0 Response to "What is Pinguecula"